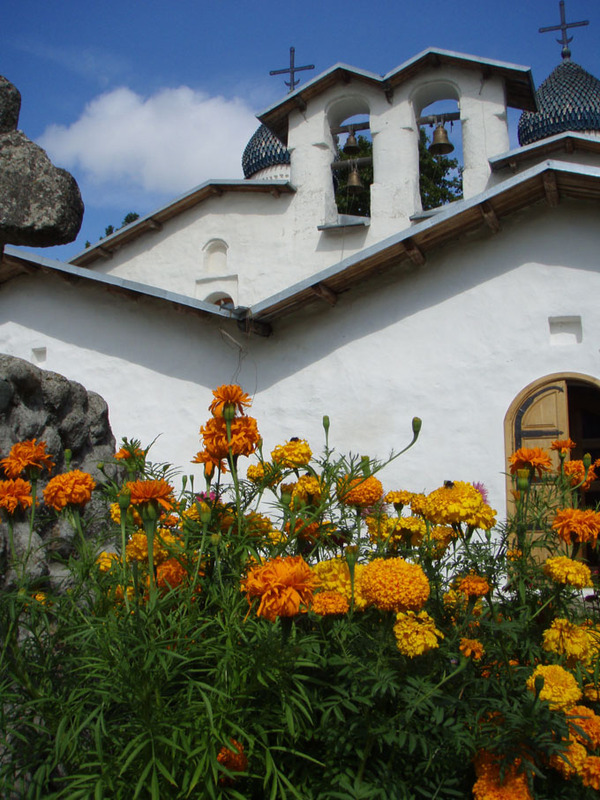 16th August – Pskov Russia! Diesel Price 26.1 Rub / Ltr (£0.57 / Ltr) !! Clocks forward by another hour. Now three hours ahead of UK. After our fairly sleepless night we headed down to the border (Koidula) waiting area for our alloted time of 6.00am. Some of the ‘diesel importers’ said that we may have to wait a lot longer, however at 6.20am our registration number appeared on the monitor in the waiting area (in the window of the blue portacabin) and we drove towards the border. It was a misty morning and we drove through to the first barrier feeling a little bit nervous. We had heard lots of stories about difficult staff and searches which included a complete emptying of the vehicle, even people being turned back after an error was found on a document …..
We arrived at a barrier and queued for a further 15 minutes before we were called forward to the first checkpoint. This was to leave Estonia. We had to show the passports (first border since leaving home), driving license and registration document (V5). There was also a check of the chassis number and a quick look in the back …. which was full of bags etc. The lady was friendly and helpful in terms of our language issues! Next we went to another checkpoint where we had our passports checked briefly and were handed two immigration cards (more smiles) to fill in before the next checkpoint which was immigration. We pulled over to a parking spot to fill them in. There are several numbers on the visa and so were confused about which number to use on the form. I went on foot to the booth to ask. A really friendly young man (Customs Officer), who spoke good English helped us. It is the top number on the right (in red ink). When completed we drove to the immigration booth and the same man helped us again. We had only filled in one side and so needed to complete the same information again on the other side of the form. He could not have been nicer! There was also another friendly man with him who asked about the trip and laughed when we told him how far we were going. They joked about the Russian roads and waved us on with a ‘Welcome to the Russian Federation’. Thank you! The next step was Customs where we needed to fill in a customs declaration form (two copies) that also covered the temporary import of the car. Again the lady Customs Officer could not have been more helpful. She helped us with every item that needed to be filled in. There is an English translation under the Russian but it is not always obvious what information is required. When the forms were stamped and completed the car was given a brief search, lasting maybe three minutes. She then reminded us not to lose either our immigration card or customs form as it would be difficult and expensive to leave the country without either of the documents. Thank you too! We were so pleased that the staff were so kind, friendly and helpful that we wanted them to know more about the trip, so we gave each of them a business card with our website address on! I hope that they look at the site to see our progress through their country ….. The whole process from booked time to arriving in the petrol station outside the border area had taken two hours. 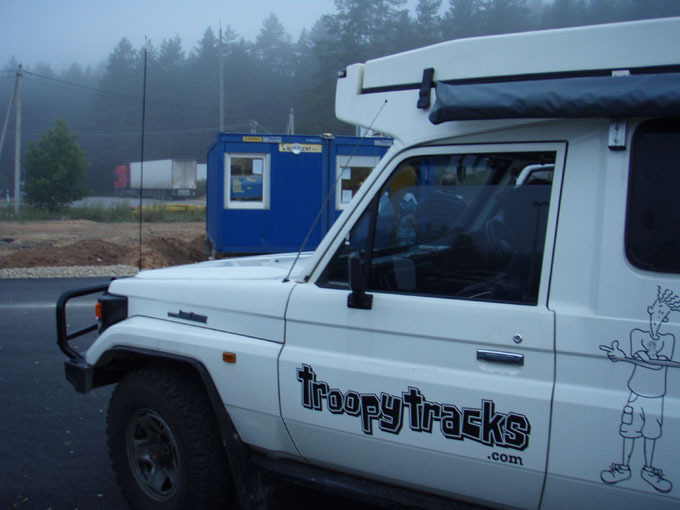 As you come out of the border area there is a charge of 150 Rub to get on to the main road, so if you are doing this crossing have some Roubles ready. 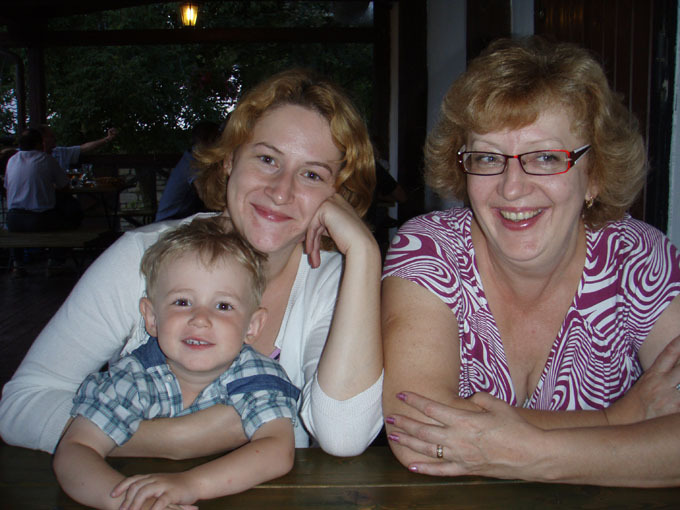 We were due to meet Olga who had been introduced to us by Liuba our Russian teacher at the petrol station just outside the border. It was also the place where we were to buy our green card (third party insurance) for driving in Russia. It was the right place, but the girl who was at the desk spoke no English and however much I tried to point at the documents and explain, she just kept shaking her head …. I was stuck! If you want to complete this step yourself without help you need to have a letter written in Russian explaining that you want a green card, with all the details of your vehicle, name, address, length of stay and anything else you can think of! We were lucky, just at that moment Olga arrived and we managed the whole process in about ten minutes. Total cost of the green card was about 2000 Roubles (£44) for the month, but is more expensive (maybe twice) if the car is over 100 hp. My V5 does not quote a figure. Olga led us to Pskov which is about 45 minutes drive. We went back to her place for breakfast and met her daughter and grandson. They are lovely people and asked us if we would like to stay in her friend’s flat for a couple of days. It would be the first time that we had not slept in the camper since Holland. After breakfast we went out sightseeing with Olga, and she had also agreed to take us to the local immigration office to complete the visa registration process. You must do this within 3 days of arriving in Russia. 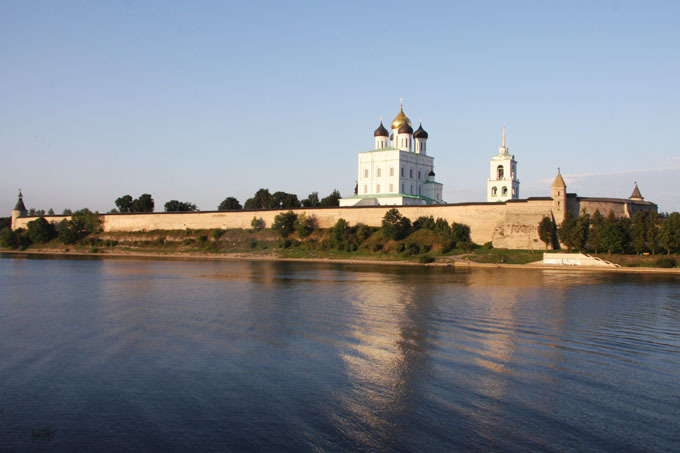 First stop was the Pskov Kremlin which is inside one of the old city walls. The city is very old and goes back to 903! 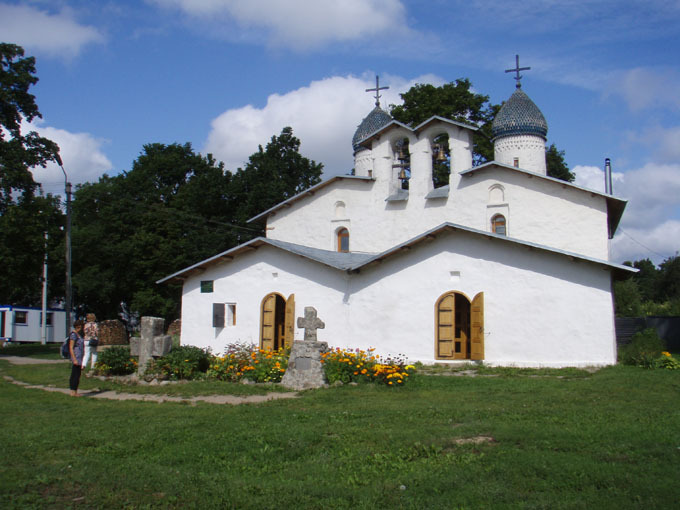 It is older than Moscow which dates back to 945. 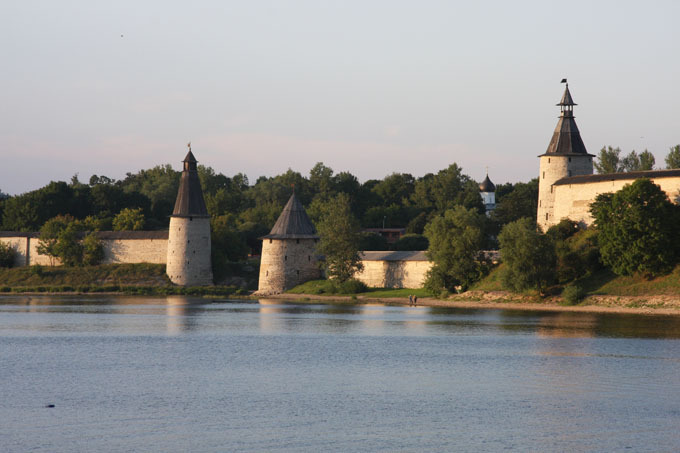 The walls and towers have been renovated, and look beautiful from the other side of the river. 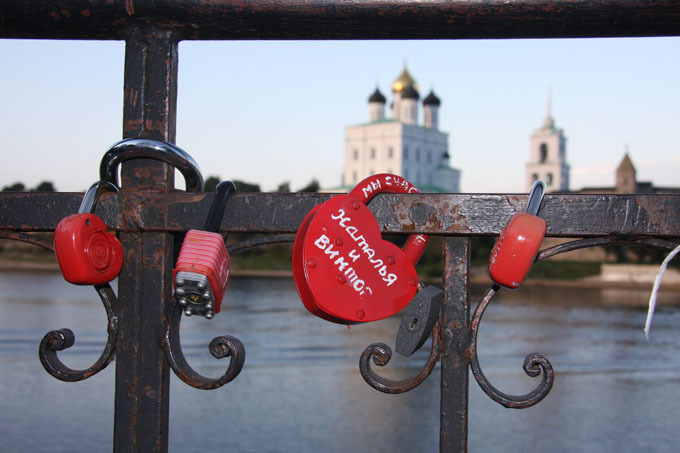 On the opposite bank of the river from the kremlin there is a railing where newly married couples stand to have their photos taken. It is traditional for them to fix a padlock on the rail as a symbol of their marriage. They either throw away the key as a sign of the permanent bond or take it home in case they change their mind !? 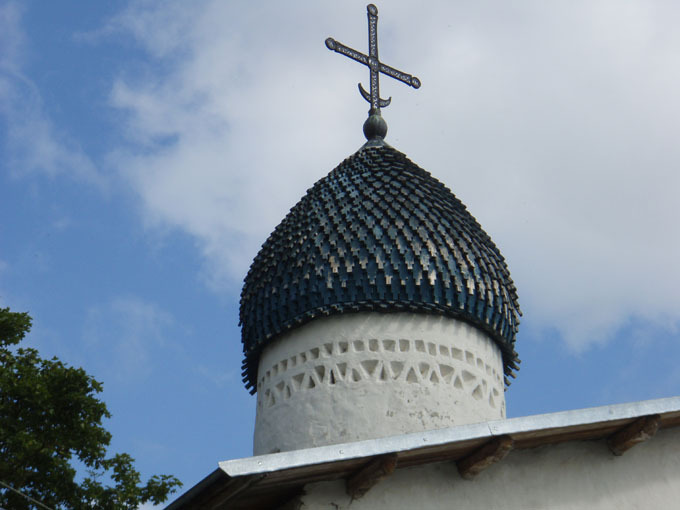 We also visited a lovely, simple church, build in a local Pskov style. 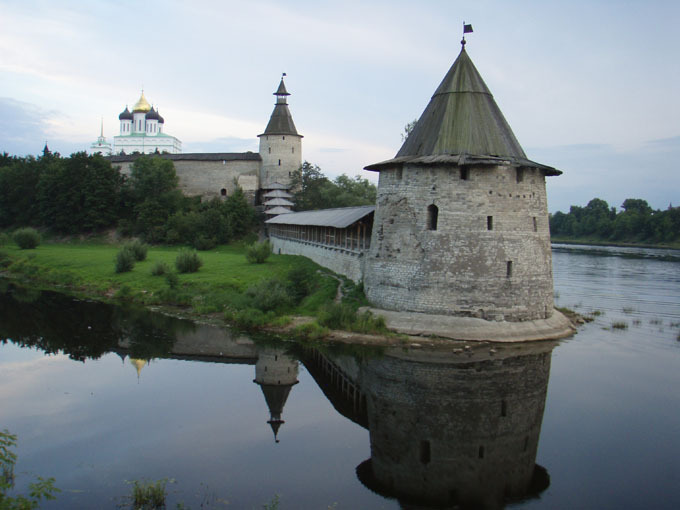 It has two towers (onions) and has an unusaual design around the tower called the Pskov necklace. In the evening we went out with the family to a restaurant and to park the camper in a secure parking for a couple of days. 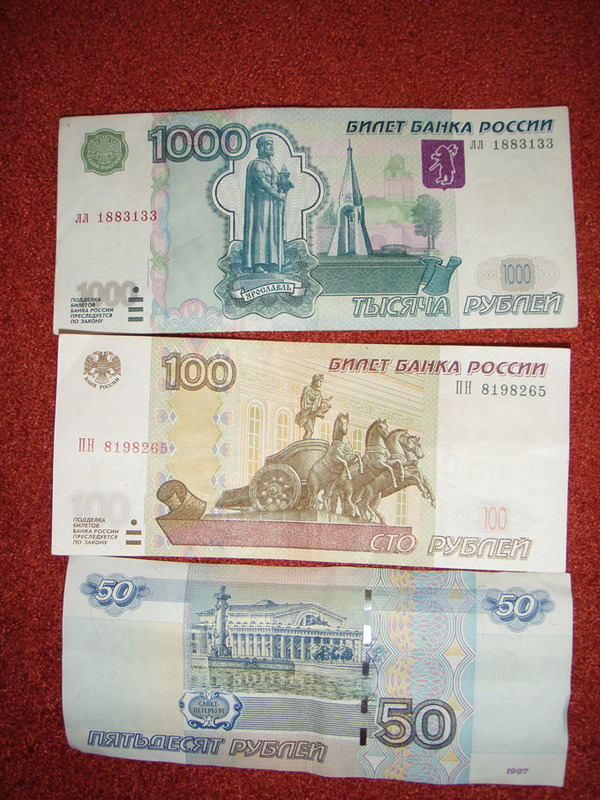 It was good value at 100 Rub per 24 hrs. 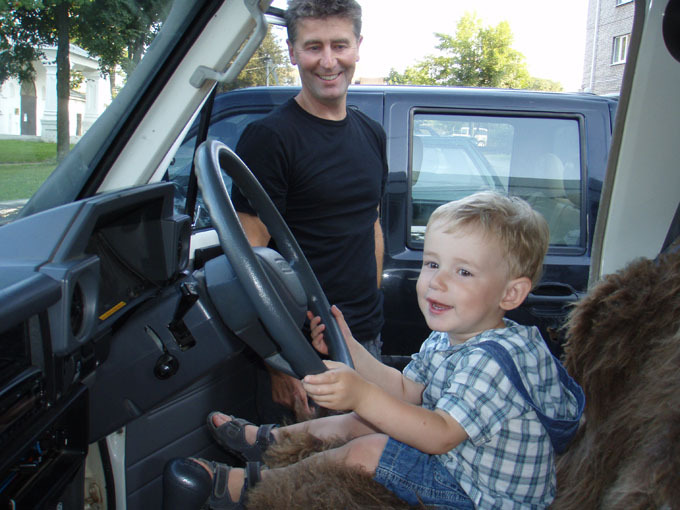 I am sure that the car would have been fine, but for our first nights in Russia we decided to play safe. On the way to the restaurant we decided to give our new reserve driver a test. He passed with flying colours, although we may need to invest in a booster cushion! It has been a great day and a lovely welcome to Russia. Thank you Olga!